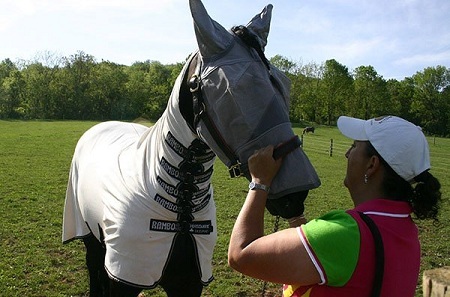 Insect control in horses in quite necessary because insects can be very irritating and at the same time they can also cause a threat to the health of a horse. There can be absolutely no doubt in the fact that the lives of horses are filled with different varieties of insects, bugs, stable flies and mosquitoes that generally feed on the blood of horses. Some insects are irritating and others possess a sting that is painful. There are some other varieties of insects that bite and bring ailments and several diseases among horses. The bad news in this case is that there are different types of insecticides available in misters, topical sprays and Foggers that come with warning signs. When hauling your horses in horse trailers make sure they are free of insects, because it is not healthy for them to have insects for on a long trip. House and stable flies are the most common pests found in horses and in all livestock. It is very important to carry out animal waste management in order to tackle with such flies. Stable flies and house flies are similar in their appearance, life cycle and size. Stable flies possess sucking and piercing mouthparts and they use these parts to penetrate into the skin of a horse and then they feed on horse blood. The bites of such flies are painful and the animals react by tail switching and foot stamping. On the other hand, house flies possess sponging mouthparts. Phosphate insecticide is the best localized treatment that can be used for tackling with both these flies found in horses. There are two species of lice affecting horses and they are horse sucking louse and horse biting louse. These are frequent pests of horses. These species of lice are mandate horse parasites and they deposit their eggs on horse hair. Horse biting louse is around one-tenth inch long and its color is basically chestnut-brown while the abdomen is yellow colored possessing dark crossbars. Horse sucking louse is around one-eighth inches long and its color is basically slate grey. Its head is narrow and abdomen broad. These are the most common varieties of louse affecting horses. Insecticide applications can help in controlling lice in horses. Ticks are generally not very common in horses, but brown dog or American ticks might occasionally cause a problem for horses. Ticks generally feed in the inner ear of a horse and this can result in intense pain being experienced by the horse. The most common control measures that can be used in dealing with ticks in horses include physically removing the ticks or using canister aerosol spray into the ear. Insecticide treatment can also be used for dealing with winter ticks in horses. There are typically three species of scabies mites affecting horses. Two species burrow into the skin of a horse while the third species feed on the skin surface. The best thing to manage scabies mite infestations among horses is to use insecticide spray. Insect control in horses should always be done by identifying the species or that particular insect that has infected the horse.